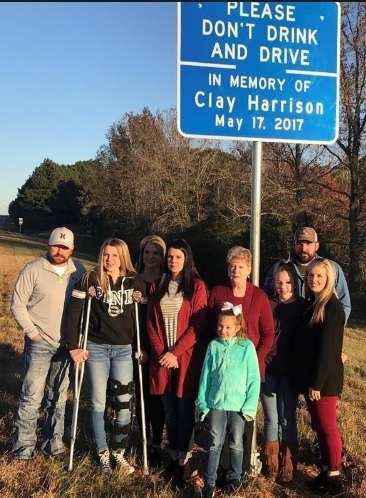 The family of Clay Harrison gathered Nov. 15 along State Highway 77 in Cass County to dedicate a memorial sign in honor of their family patriarch who died last year in a tragic crash with an impaired driver. Pictured from left are Jeremy Osmon, Calli Osmon, Miranda Martin, Holly Osmon, Tenley Martin, Barbara Harrison, Natalie Cobb, Clifton Harrison, and Lauren Harrison. Not pictured was Brent Martin. ATLANTA – The Harrison family of Naples, TX solemnly gathered Nov. 15 along State Highway 77 near Marietta to dedicate a sign honoring their family patriarch. It was at this location last year where the 61-year-old husband/father/grandfather died in a tragic crash with an impaired driver. Clay Harrison was driving home May 17, 2017, on a straight and open section of SH 77 when a drunk driver, traveling the opposite direction, veered into his lane and hit his vehicle head-on. Harrison was pronounced dead at the scene a few minutes later. The impaired driver survived and was flown to LSU Medical Center in Shreveport where his blood alcohol level was determined to be 0.156, almost double the legal limit. The intoxicated driver was later charged with felony intoxication manslaughter and is now serving a 14-year prison sentence. The Harrison family wanted to do something to commemorate Clay and also remind others the severe and often fatal consequences of drinking and driving. They heard about the Memorial Sign Program for Victims of Impaired Driving offered by the Texas Department of Transportation (TxDOT) from a Mothers Against Drunk Driving representative that visited with the family. Under the program agreement, TxDOT will erect a sign at the scene of the crash site where it will remain for two years. It urges drivers to “Please Don’t Drink and Drive” and will post the victim’s name and date of the fatal crash. At the end of the two-year period, the sign is taken down and presented to the family to keep. There is a $350 fee for the cost, erection, and maintenance. Anyone having questions or need additional information about the memorial sign program can contact their nearest TxDOT district office or email TRF_TE_MSP@txdot.gov.